Evergas has ordered four 32,000-cbm carriers for liquefied ethane/ethylene (LEG) gas from China’s JHW Engineering & Contracting (JHW), with options for two more. The gas ships will be delivered to Evergas from first quarter of 2018 onwards and will enter into service for Ineos, alongside Evergas’ existing multigas fleet. The contract price was not disclosed. The INEOS-max vessels will have dual-fuel propulsion based on either LNG and ethane and the usual marine gasoil, as well as a ballast water treatment system. The vessels’ energy-efficient design will be certified with Clean Ship and Green Passport notations, and will be compliant with EEDI phase III. 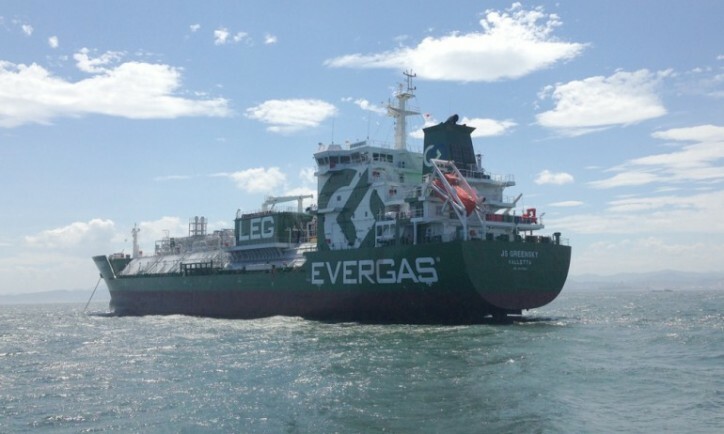 “The cargo capacity has been increased more than 10% by optimising the design of cargo tanks as well as the layout of ship, without changing the main dimensions compared to the latest designs of 27,500-cbm class gas carriers,” Evergas said in a statement on Tuesday (Dec8). Evergas currently has five 27,500-cbm multigas (LNG/ethane/LEG/LPG) carriers under construction in China for delivery in 2016. Three vessels have already been delivered and are currently employed in importing ethane derived from shale gas from the US to Ineos’ manufacturing sites in Europe. Once the new INEOS-max vessels arrive in 2018, Evergas says its existing multigas carriers “will be available for trade on the growing midsize LNG transportation market”.